Moraga Short Sale For Sale, Just Listed On The Market! Another Moraga short sale just listed on the market by East Bay Short Sale Group. We’re very excited to have a new short sale listing coming up this weekend in Moraga including an open house for interested buyers. 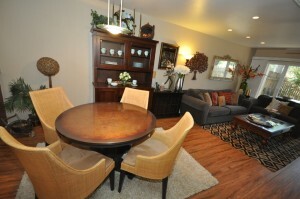 The Moraga short sale is located at 651 Moraga Road, Unit 33. This is a two-bedroom, one and a half bath condo with 2 stories. 36 units total in the community and its 1,144 square feet. Lots of updates including light and bright paint. Lots of things are going to make this a very good deal for a potential buyer. This home has tons of updates, including updated bathrooms, recessed lighting, custom paint, updated flooring, and much more. The roof is less than 2 yrs old and there are also 2 skylights in this unit, very rare for this community! The community includes a swimming pool, several paths, and is in very close proximity to restaurants, shopping, and much more. This Moraga short sale townhome-style condo has a loan with CalHFA 1st loan, and the short sale has been pre-approved at $320,000, so we’re going to be listing this on the market. It’s certain to go very quickly, and we’re very excited to find some potential buyers who are interested in this. If you have any questions on this particular property, feel free to let us know. Again, this Moraga short sale should go pretty quickly since we are going to be able to…it’s priced fairly, and also the bank has already done most of the legwork on the short sale approval, so our objective is to get this closed for the buyer by the end of the year. So if you’re interested in this, feel free to let us know. You can reach us with our contact information on our website which is East Bay Short Sale Group, or at 925-567-6720.